The basic sustenance and growth of an economy is directly proportional to the % of its educated population. Students are more aware of their interests and look for institutions that deliver quality education along with flexibility and total transparency. IT'S ALL ABOUT CONFIGURABILITY, FLEXIBILITY AND SECURITY!! The overall solution has been stitched together through the collective experience of over two decades by a group of professionals who have extended consultancy services to large school campuses and brought forward the complexity to the very elementary nuances of a school management, on one side as functional experts, and iTWINE, an IT Solutions and Services company, that has delivered IT solutions which have stood the test of time In terms of depth, complexity and technology. Encompassing such level of intricate detail has resulted in the development of a solution that is not only easy to implement and use but embedded with the best practices and technology that is usable across all possible platforms of today, be it a mobile phone, tablet or desktop. iTWINE's expertise also extends to solutions in the eLearning, On-line Testing and Certification, Campus Management solutions amongst other solutions to a spectrum of industry verticals. Configurability to create and inform, and be informed of events happening on and off campus by glancing at color coded calendars. Flexibility to define Term Holidays, Study Holidays, Public Holidays and more. Additionally, configurability to apply these to various School Levels and Grades where applicable. Secure, comprehensive, and robust. 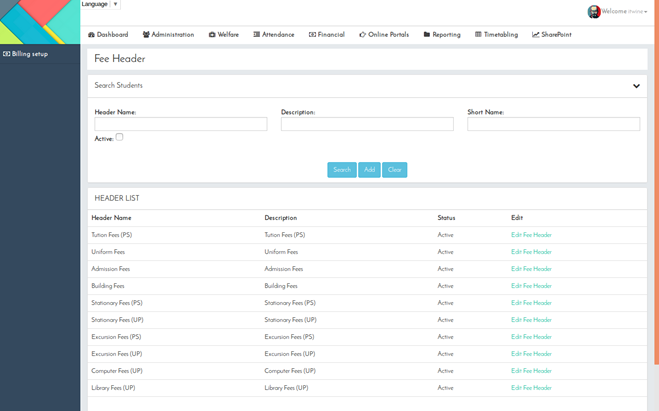 Provides a flexible, fast and efficient way to configure fee structures, apply them to students, create and apply concessions to student fee where applicable, generate bulk/individual fee invoices and account receipts, integration to Parent login for information and online payment where applicable. 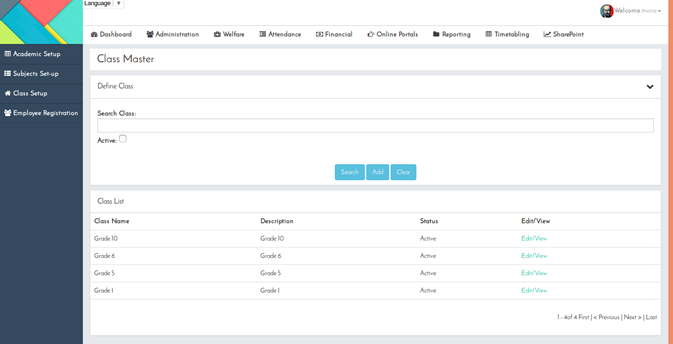 Configurability to define Fees at monthly, quarterly, half yearly, yearly or even at Term levels. Flexibility to maintain and apply different key components that make up a Students Fee structure from Tuition Fees, Term Fees, Building Fees, International Fees, Uniform Fees, Books and Stationary Fees, Lab/Library Fees, and any specific fee components as per the School. Flexibility to efficiently manage the complete student admission process using customized admission forms available in the School Websites and help welcome applicants that are the best fit for the institution including the migration of old students during the promotion process. 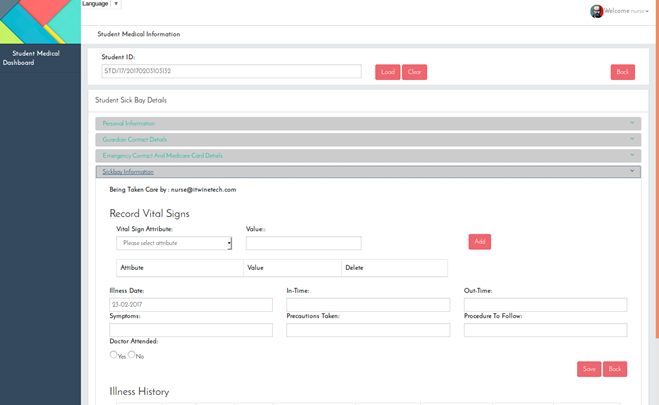 Configurable screens to capture detailed demographic of aspirants, their parents/guardians/emergency contacts, siblings, medical details and much more. 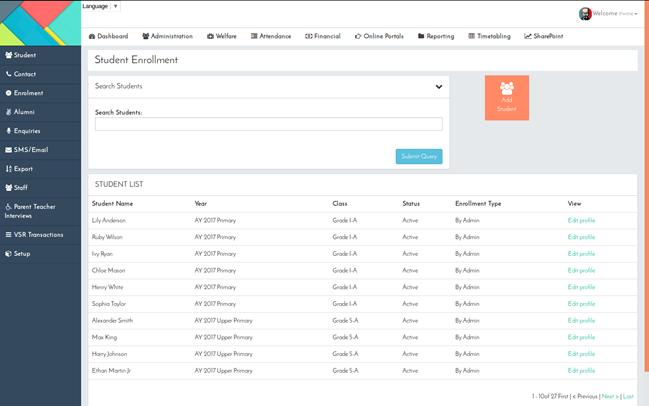 Being fully integrated with the Fee Module and accounts sections, the flexibility to assign fee groups and concessions of a variety of applicability such as Concessional Students, International Students, and discounts based on siblings attending the same school and more. Comprehensive records of Teaching, Non-Teaching and Administrative Staff; their demographics; Certifications and their validity with alerts well in advance of their renewals; specializations and links to School Levels they are certified to teach, and more. 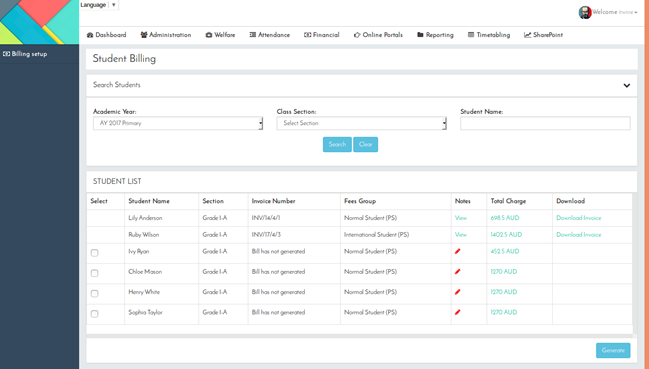 Configurable templates for notices, announcements, Teacher messages, special events, school regulations and more. Configurable methods to communicate these messages through a robust integration with a Content Management System and eMail/SMS integration. Send bulk emails to selected group of recipients or all. 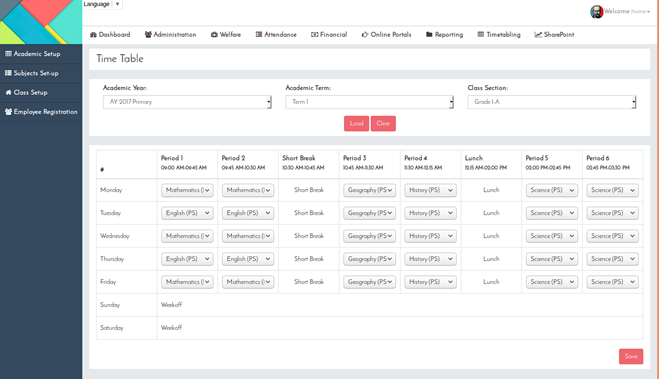 Notify concerned recipients with auto triggered email alerts on invoice payment, assignments, notices and circulars, attendance, progress reports, prior information about school events and holidays, leave applications, interaction to and with teachers through chats/messages, and more. Configure and integrate to iTWINE's Web based State-of-the-Art Human Resource Management System (HRMS) including Payroll which is a well-orchestrated sequence of activities that ensures to cover the complete life cycle of an employee. A solution that is so flexible and configurable that it can support an institute as a single entity or an institute with multiple campuses each with its own hierarchy HR rules, processes and salary scales. Configurable and Flexible Payroll Processing: The flexibility to create Groups, Salary Components, Salary Scales and special components that form part of an employee's perquisites. Salary components based on parameters such as qualifications, experience, trainings attended, over all hours worked and more. 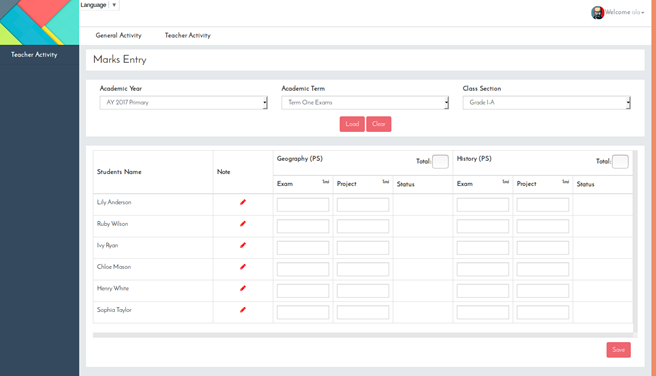 Configure tardiness policies, their assignments, benefits and perquisites, holidays and leave structure, and more..